The New Hampshire State Prison and the Department of Corrections has a long, fascinating history. It begins only 34 years after the signing of the Declaration of Independence. Here are some highlights. 1810 The NH General Court appropriates $8,000.00 for "the erection of a State Prison of stone in the town of Concord, in the County of Rockingham…" on two acres of land near the Court House. It was to consist of two wings, each 80' x 36', three stories high, with 36 inmate rooms. There would also be a 3-story Superintendents house attached. 1811 Another $18,000.00 was appropriated for the project for modifications to expand it to four stories. 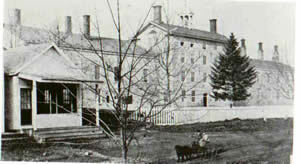 1812 The building was completed and occupied by a single inmate. 1831 Another $3,000.00 was allotted "for the purpose of erecting a new State Prison on the land now occupied…for a State's Prison." This was actually a new wing with another 127 cells. It was completed in 1832. 1869 Josiah L. Pike is the first New Hampshire prisoner executed. 1874 Governor James A. Weston and the Executive Council appoint a three-member committee to study the need for, costs, and proposed location for a new state prison. The final report cited deteriorating conditions, problems with discipline, and consistently large expenses for repairs. It was determined "a substantial building upon some other site cannot be wisely and safely delayed." 1877 The Legislature produced "An act providing for the erection of a new state-prison." Three commissioners were appointed to procure plans and specifications for a new prison, with all-necessary offices and work-shops. The cost was not to exceed $200,000 and be sufficient to accommodate and employ 200 convicts. --By November, the units of the institution were outlined as 1. Dwelling, 2. Central of main building, 3. North Wing, 4. South Wing, 5. West Wing, 6. Workshop, and 7. Wall and yard. 1878 Ground was broken on May 3, 1878. Funding was allotted for 47 additional cells. The new prison was occupied by November. Warden Frank Dodge declared, "I take pride in claiming for our state one of the best built and most convenient prisons of modern world." Within months, the physical and moral condition of the prisoners had much improved. No significant changes would be made to the physical structure for many years to come. 1884 The first federal prisoners are housed at the prison. 1885 Outer buildings completed. These include a new stable, tenement houses, wood shed, and a front fence. 1902 Internal improvements are made including a new laundry vent, eight new bathtubs, and protective porches over the yard entrances (against falling ice and snow.). 1906 A new prison school for illiterates is established. First inmate was paroled. 1908 Governor Charles M. Floyd and the Executive Council abolish red and black striped prison uniforms in favor of gray. 1910 Prison cells fitted with electric lights. To this point, candles had been used. 1914 In July there was a disastrous fire in the ward outside the walls. 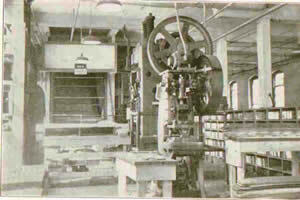 1917 For the first time inmates were paid a daily stipend to work on contracted projects in Prison Industries. The rate of pay was ten cents per day. 1921 Radios are installed in the prison cells with "fine entertainment…coming to us from as far as New York and Pennsylvania." 1926 The State Department of Education is enlisted to assist the educational program of the prison. The Legislature appropriates $200,000.00 for the establishment of new industries. The license plate shop, sign shop, the print shop and the farm are seen as the most promising fields. Also, the first conditional pardon was granted to an inmate. To the right, the original license plate shop. 1934 Individual sanitary facilities installed in each inmate cell. Industries established. New infirmary and dental office built. 1939 Howard Long is the last New Hampshire inmate executed to date. 1941 The prison entrance is remodeled so that visitors would enter into a reception area rather than through the main building. 1943 World War II creates challenges hiring officers. Fuel conservation for the war effort closes a new cellblock. Difficult steel acquisition closes the Tile Plant. 1949 Much of the prison was completely repainted and the Warden's residence was renovated. New parking facilities were added. Much landscaping was done. Many of the trees planted this year are still on the prison grounds today. 1950 Inmate classification system instituted at the prison. This allowed for safer and fair distribution of prison population throughout housing units. 1951 Alcoholics Anonymous was introduced in the prison. 1952 Stainless steel tables were installed in the dining room to replace wooden tables installed in 1919. 1954 Considerable renovations were undertaken. The control room, officer's room, and visiting room were renovated and upgraded. Electric doors installed. New laundry and kitchen equipment was installed. A new library was constructed. Many units were completely re-wired. 1956 Warden and Deputy warden's residences converted to administrative office space as inmate population grows. 1961 The southwest corner of the old prison yard is converted into a 90' x 60' multi-purpose inmate recreation area. 1962 The New England Interstate Corrections Compact is created thus allowing for the transfer of inmates to other states. 1966 The first television is installed in the recreation room for inmate use. 1967 The Community Release Law is passed by the Legislature allowing the Warden to release any inmate in custody to seek gainful employment. Certain stipulations apply regarding the type of sentence the inmate is serving. 1969 First full-time educational director appointed. 1971 Warden and Deputy Warden residences are further converted to house expanding inmate treatment programs. 1973 Shea Farm Halfway House opens in Concord becoming the first housing unit to open off the grounds of the state prison. As inmates near their parole dates, they are housed here as they seek work and prepare to return to society. 1976 Auto repair shop is completed. Medical coverage is increased to 24 hours a day. Inmate law library purchased. 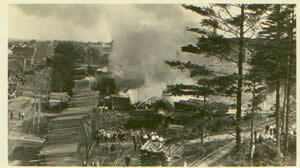 1977 Fire damages the roof of the prison recreation building. Arson was the cause. 1978 A 1970 lawsuit results in the Laamen Consent Decree. This requires the State Prison to provide adequate programming opportunities for inmates. While there would be many incarnations of the decree until the 1990's, steps are taken to expand and greatly improve programs. 1979 Calumet Halfway House opens in Manchester. The legislature appropriated $200,000.00 to acquire the historic building from the Catholic Diocese of Manchester. Inmate labor was used to bring it up to fire codes. 1980 State Prison staff now attending 12-day formal training sessions with NH Police Standards and Training Council. In-service and pre-service training greatly expanded. 1981 Hancock Recreation Field completed and dedicated. It includes a new security tower. Governor Hugh Gallen attends grand opening. Major new housing construction project begins. Also there are many significant renovations of the administrative offices, chapel, staff and inmate dining areas, and in inmate dormitories. Inmate labor used significantly for the work. 1982 Major construction work is underway on a new Special Housing and Close Custody Units to house maximum custody and punitive segregation inmates. 1983 The Department of Corrections is created by statute and becomes operational. Governor John H. Sununu and the Executive Council appoint Ronald L. Powell as Commissioner. This action consolidated the previously independent Probation Department, Parole Department, and the State Prison into one state agency. 1986 The Secure Psychiatric Unit opens. Medium Custody Units begin operating. Massive renovations and construction projects are completed and a vastly expanded prison is operating. 1989 The female facility opens in Goffstown. The DOC enters into a lease agreement with Hillsborough County to modify a building as a satellite unit of the men's prison in Concord. 1990 New Hampshire Department of Corrections becomes one of only three states to be fully accredited by the American Correctional Association for excellence in operation. The Shock Incarceration program opens. The 120-day intensive experience is designed as a diversion for inmates who have committed non-violent crimes. Also the Administrative Home Confinement program begins. 1991 The Lakes Region Facility in Laconia opens. The facility is a minimum/medium-security programming institution that opens on the grounds of the former New Hampshire State School for the developmentally disabled. 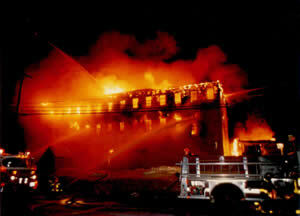 1994 On a cold winter's night a spectacular fire destroys the men's prison warehouse. The wooden structure dated to the early 20th Century. The fire smoldered for days and a cause was never satisfactorily determined (Right). Governor Steve Merrill and the Executive Council appoint Paul Brodeur as Commissioner. The NH-DOC Honor Guard is formed to represent the department at ceremonial functions. 1996 June 7: 96 medium security inmates barricaded themselves inside the D-Pod of the Hancock Housing Unit damaging furniture and plumbing. One inmate suffered minor injuries. The 6 1/2-hour tense standoff ended when the prison's Special Emergency Response Team entered the unit and dispersed the group. North End Halfway House opens on prison grounds. 1997 Governor Jeanne Shaheen and the Executive Council appoint Henry Risley as Commissioner. 1998 Groundbreaking begins on construction of an adult prison in Berlin. 1999 Commissioner Risley dies in a plane crash. 2000 The Northern NH Correctional Facility opens in Berlin. Governor Jeanne Shaheen and the Executive Council appoint Phil Stanley as Commissioner. 2001 Governor Jeanne Shaheen and the Executive Council appoint Jane Coplan as first female Warden of the men's prison. Corrections Creations opens at its new location in the former prison stables. A large crowd of shoppers turns out for the grand opening ceremony. On December 24, The Special Emergency Response Team (SERT) removes 16 inmates from their housing unit after they become disruptive. 2002 The Commissioner orders sweeping changes in the health services unit as medical costs continue to soar. More than 12% of the current inmate population is over the age of 50. Long standing inmate programs get a makeover to better meet the needs of offenders. The classification process is streamlined. More emphasis is to be placed on substance abuse issues of newly arriving inmates. 2003 There is a budget proposal to consolidate the NH State Prison for Women with the Lakes Region Facility. After considerable public discussion, the legislature opts to keep the Goffstown facility open. A bill later passes in the legislature to further study the needs of female offenders. In June, three inmates make a dramatic escape by cutting their way through the secure perimeter at the NH State Prison in Concord. They are apprehended one day later in Massachusetts after a nationwide search. In October, Commissioner Phil Stanley steps down as Commissioner after a 3 1/2 year tenure. 2004 Governor Craig Benson and the Executive Council appoint Stephen J. Curry as Corrections Commissioner. The Shea Farm Halfway House becomes an all-female facility to allow the department to provide programming specifically geared toward female offenders transitioning back into the community. The 28 Day Parole Violator's Program is implemented. It is designed to provide parolees at risk of returning to prison with tools and resources to keep them out of prison. The New Hampshire Legislature forms a committee to study a complete reorganization of the department. Work begins on implementing a statewide offender management database, which will provide the department with better information on offenders as they enter the system, participate in the system, and leave the system. A foster kitten program is implemented at the NH State Prison for Women in association with the Animal Rescue League of New Hampshire. In the first six months more than fifty kittens were adopted from the program and placed in homes. A service dog training program is implemented at the NH State Prison for Men in Concord. Governor John H. Lynch and Executive Council appoint William L. Wrenn as Commissioner of Corrections. Inmates are evacuated from the Shea Farm Halfway House due to floods and road washouts. They return two days later. The Department is court-ordered to implement a Residential Treatment Unit for inmates with mental health issues. A major roofing project is completed at the NH State Prison in Concord. These are the first major renovations in over twenty years. A Residential Treatment Unit is implemented at the Secure Psychiatric Unit in Concord. The Department hires a Female Programs Administrator in response to the growing population and an effort to develop more gender-specific programs. Due to the growing female population the Department enters into a two year agreement with the Strafford County House of Corrections to house the overflow. The Department enters into a four year agreement with M-H-M of Vienna, Virginia to provide mental health services to the offender population. The pre-service Corrections academy switches to a nine-week format in which officers attend the whole nine weeks while non-direct care civilian employees attend only part of it. Funding was requested to construct a new female facility and female halfway house. The Division of Community Corrections is formed to provide community-based support for offenders in the community. 2010 Governor Lynch signed the Justice Reinvestment Initiative into law. Prison population declines by 11.3% as a result of the 2010 Justice Reinvestment Initiative. Eight Corrections Counselors/Case Managers are assigned to four District Probation/Parole Offices to implement evidence-based treatment and programming. The Bureau of Programs is consolidated under the Division of Community Corrections to promote a continuum of treatment and care from prison admission, throughout the offender's incarceration and parole supervision, until the sentence is concluded. 2012 A new 40 bed wing is opened in the Residential Treatment Unit in Concord to provide evidence-based care and treatment for qualified inmates. 2013 The New Hampshire Legislature allocated $38-million to design and construct a new women's prison in Concord. 2017 Commissioner William Wrenn chooses not to seek reappointment. Assistant Commissioner Helen Hanks is sworn in as the new Commissioner. 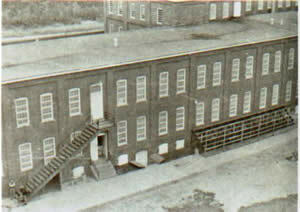 From 1880-1941, female inmates were housed in Concord in the South Wing of the new building. In 1941, the legislature authorized the transfer of female offenders to other states, specifically to the Women's Reformatory in Rutland, Vermont. Up until that time there were never more than six female inmates in the state's custody. On November 28, 1941, the last female inmate was transferred out of New Hampshire. On July 30, 1967, the Women's Reformatory closed. From 1967 onward, most New Hampshire sentenced women were sent to the Massachusetts Correctional Institution in Framingham. During the 1970's, some females were also housed in county jails. Later some are housed in the Manchester Community Correction Center. During the 1980's, concerns arose about the inadequate conditions for females at the other facilities as well as concerns by females about being so far away from their families and loved ones. Issues arose regarding programming opportunities for incarcerated females. A group of female offenders won a lawsuit, which required the state to locate a prison for women in New Hampshire. Initially, the department explored the possibility of renovating a building at the former Laconia State School for the housing of female offenders. That did not come to pass. In 1988, the Department of Corrections entered into a lease agreement with the Hillsborough County Commissioners to modify a facility in Goffstown, which would be vacated by 1989 upon completion of a new county facility in Manchester. 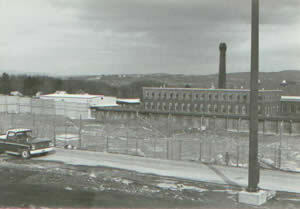 Surplus capital funds from the major construction projects of the 1980's at the men's prison were used to renovate and upgrade the Goffstown facility to appropriate security standards. The women have been housed at this facility since. In 2007 the Department entered into an agreement to house 36 females at the Strafford County House of Correction in Dover to ease overcrowding. In 2013, the Legislature appropriated $38-million to construct a new 224 bed women's prison. It will be located in Concord, New Hampshire. Construction is scheduled to conclude in 2017. In July 2015 the the facility was renamed the New Hampshire Correctional Facility for Women to better reflect its overall mission. In 1994, the New Hampshire's adult inmate population surpassed 2,000. The need for another institution was seen as a solution to alleviate this problem. During 1996, the NH-DOC explored using existing but vacant buildings in Antrim, Hooksett, and Portsmouth to house a new prison. Negative public sentiment and in some cases the extensive renovation work that would be needed proved to be a challenge. The DOC later made a proposal to the City of Franklin for the construction of a new prison but a local referendum turned it down. A State Senator invited the Department to build a prison in the northern region of the state. The DOC initially looked at the town of Lancaster but then abandoned that and set its eyes on Berlin. Coincidentally that same year, a Texas-based private prison company had prepared some preliminary research on building a facility in Berlin but that did not occur. However this research proved helpful to the state in determining an acceptable building site. The Legislature agreed to float a $30 million dollar bond to construct the new prison. The initial prison would house 500 medium security male inmates with the possibility of expansion to 1,000 at a future date. The DOC contracted with a builder, which specialized in the construction of prisons. Groundbreaking began in 1998 on the new building. It was completed in March 2000 when it was opened. With the closing of the Lakes Region Facility in 2009 one of the two gymnasiums at the Berlin prison was converted into a 112 bed minimum security unit. In 2011 the population had decreased to the point that this dormitory could close. Inmate overcrowding issues of the 1980's and the need to develop goal-orientated programs resulted in the opening of the Lakes Region Facility in Laconia in October 1991. The site of the new facility was the recently closed Laconia State School for the Developmentally Disabled. There were multiple buildings on the state-owned property laid out in a campus style setting. The infrastructure was already in place, thus the need to use additional state funding was drastically reduced. Negotiations with the City of Laconia proved to be a challenge for the NH-DOC, as local residents and city officials were reluctant to accept a prison. The institution was approved as a temporary measure. However, a series of stipulations including implementing a cap of 300 inmates were embraced to allow for the facility to open. In 1997, LRF became a permanent facility. The 300 cap was increased to 500 with the capability of expanding to 600 beds in the future. The buildings, many of them built in the 19th century, had been vacant and in disrepair. An inmate labor force was responsible for nearly all of the major renovations. Consequently upon completion, both male and female inmates would be housed at LRF to participate exclusively in substance abuse, educational, self-improvement and other programs. In 2004 the Department announced that the Lakes Region Facility would be converted into a transitional facility for minimum security inmates who would soon be released. The Department removed the female offenders and split them between the NH State Prison for Women and Shea Farm Halfway House in Concord to house only male offenders. The Department also implemented a Parole Violators Program.